Patient and presenting symptom: 32 year old male complaining of migraine. Ghanshyam Kalathia (GK): Tell me about yourself and your problems. P: I have had migraine headaches for the last 5 years. The pain is very, very severe. I can’t concentrate on anything. When I have to study or when I have to prepare an annual report or monthly progress report for my work, I get this kind of headache. When I have to concentrate on one subject, I have an attack of pain. If the pain is present, there is no way to make it go away. For the last two or three months I notice that during my headache if I eat something in large quantity, I feel better. GK: What do you feel in your head during a headache? P: I feel as if my head is becoming bigger and bigger (HG expanding his hands.) I feel like my brain is swollen during the pain – and it’s not just my belief but I sometimes see that my head is a little bigger than usual when I look in the mirror. Mostly the pain starts here (first cervical vertebra) and goes up. Sometimes it covers my whole head or sometimes I feel a sharp shooting pain, like electric jerks passing from the base of my head to the forehead. GK: How do your problems bother you? P: Since I have this pain I have lost interest in everything. I have lost the charm of my life. I don’t wish to do anything. Nothing is important for me. Everything is just routine and casual, nothing is special. I miss my glorious days of college life. P: I had charm in my life. Everything was so interesting and exciting, sometimes I forgot to eat and drink. I hate my present job, it is very, very down to earth, there is nothing new to do in my job. Everything is just routine and casual, there is nothing interesting to make you feel excited or happy. Everything is just boring and it absorbs the beauty and charm of life. I feel I’m wasting my life and youth in this very boring work. I feel as if my age has doubled since I started this job. I have really lost the charm of life. GK: What is the charm of life? P: Charm means you feel younger than your real age. You enjoy every moment of your life. You wish to live life with full interest; you feel that life is beautiful. It’s only possible if you see every moment of your life as exciting. If you have a lot of excitement in your life there is no place for boring and dull and casual things in your life. GK: What is the difference between a boring life and an exciting life? P: In a boring life there is no charm. In an exciting life you feel younger and more active. Every moment you feel “let’s do this, let’s do that.” Everything is very, very interesting for you. You try to enjoy every moment of your life. He becomes more active, he starts to speak faster, constantly moving his body. GK: Now, forget your life. We are going to talk in general, so tell me whatever comes into your mind spontaneously. What is excitement? P: Excitement means you are filled with joy and happiness. Your whole being gets excited and you feel a little warmth in your body. You feel lot of movement in your body, as if everything is rushing in you. My head becomes very hot when I get excited; I feel heat here (left side of head). I see excitement in his talk. P: Right at this moment I’m excited. I feel warmth in my whole body and I feel as if something is rushing upwards in me, in waves. At this moment I forget my dull, placid life. I feel very powerful inside. It feels as if every cell of my body becomes active and rejuvenated. At this moment nothing is stagnant in me. I feel the deepest part of my body. There is nothing boring and dull now, everything is very beautiful and happy. Generally when I get excited, I feel dryness in my throat and I need to urinate frequently, sometimes every 10 minutes. P: I feel ashamed to say, but I have very bad dreams. I always see girls in my dream. I get excited after this kind of dream and I wake up. I see a clear polarity of excitement and dullness. He is affected by change: even the smallest thing affects him, so I decide to select a medicine from the plant kingdom which has central theme of excitement / dullness. In the Labiatae plant family we have excitement which is vivid, pleasant and tremulous whose opposite is dull and boring. His migraine comes periodically, so I select Collinsonia, in the malarial miasm. Follow up after one month: there is no headache since one month and he feels a little better mentally, so I decide to wait and watch. Follow up after three months: he calls with a severe attack of migraine, needing an urgent appointment. P: Since last night I have a very, very severe headache. I can’t bear it. It is terrible. I feel as if my head can burst at any time. It’s very swollen inside, I think (HG). GK: How did the headache start and what are the symptoms? P: Yesterday was a holiday, so I was at home. I watched a cricket match on TV, the whole family was watching it. The match was extraordinary: right up to the end of the match, nobody knew who would win. It went on all day and night, ending at 11:30pm. The whole family was very, very excited, having fun, all in a relaxing mood. But as the match finished, I started to feel pain in my head: it rose up slowly and finally it became so bad that I vomited 2-3 times, but it was still there. It was biggest headache of my life and lasted longest. I think the excitement of watching the match may be the reason for the headache. It’s the first time I have seen a clear cause of the headache. GK: What was your feeling while watching the match? P: Obviously the feeling was excitement. We were all next to the TV and every moment was very, very breathtaking. I was full of energy, shouting and talking constantly, very restless. GK: What is your experience when you have such kind of excitement? P: Full of fun and happiness. I feel as if every cell of my body becomes active and excited. I feel a rush of something from feet to head. I feel warmth and feel as if the blood is being pumped fast in my body. My whole being becomes so excited that I feel a little warmth inside, breathtaking moments, working inside, fast (he talks very fast). GK: Describe how everything works inside? P: I feel every cell of my body. Nothing is sleepy or lazy at that time, everything is in movement. Every part of my body is doing its best. I feel how the blood is flowing inside my body. I sense every change in me. A few seconds previously, you are normal, and suddenly everything is changed, as if you are a completely different person. You are sluggish, loose and lazy and suddenly you become very alert and active. Everything gets changed inside you. Now, the excitement is not central in the case but the ‘process’ of excitement is central. In our first consultation I made a mistake, taking “Excitement” for granted and not trying to explore it further. In reality, there is something beyond excitement which is ‘how excitement happens in the body’ – the physiological process of excitement. P: It’s like something boiling inside of you. For example, if somebody used bad words against you, you feel how the blood boils inside of you. It was pure excitement, nothing else. GK: Now, forget yourself and just talk about excitement in general. P: Excitement is nothing but some phenomena or process of our body. It’s nothing but coordinated action of our body and mind. The mind orders the body and the body starts to become alert. I think some kind of chemicals play a big role at that time. It was a moment of high alert of my entire being. In sarcode cases, patients usually correlate their experience with a process which is happening in the body or an exact functionality of a specific organ or system of the body. P: Yes, the mind orders the body via some chemicals or direct order through your nerves and the body secretes some chemicals which spread very fast in the blood. For the fastest supply of that chemical to the end organ, the body makes the blood circulate very fast – that’s why you feel that kind of rush in you. I’m not a medical student or a student of biology but I have told you whatever I know and am able to describe. 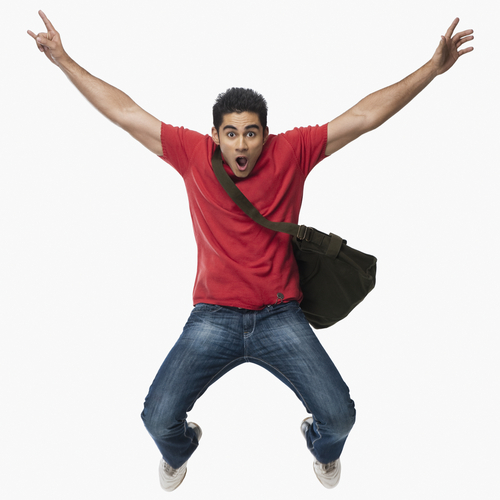 Excitement is nothing but a coordinated process of mind and body. GK: Describe that process a little more? P: It’s a process of tackling your being via chemical reactions. Suppose some sudden, unexpected change happens in you, then the body and mind react very fast via chemical reactions. It’s nothing but a process of creating stability of your body and mind. This is the way the body handles conditions that happen unexpectedly, it’s a reactive method of our being. For example, if you are standing with an unknown girl and suddenly your girlfriend touches you from behind, what happens to you at that time? We call it an adrenaline reaction. P: Yes, exactly. 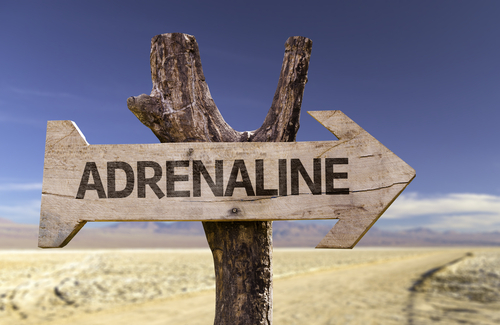 Adrenaline is one kind of chemical created in our body during any kind of sudden change like sudden fright or excitement, like when your girlfriend kisses you for the first time, when you have extreme anger, when you are watching exciting programs on TV or when you receive unexpected news. It’s the reacting agent of our body’s defense mechanism. I think that God put an adrenaline factory in me by mistake (he laughs very loudly)! GK: What is your experience right at this moment? P: I don’t know why, but my headache is gone now. It’s the first time in my life that the headache is gone without any painkillers. I think your presence is therapeutic for me (he laughs)! GK: What do you understand from our talk today? P: Now I understand that I react more than I act. I think excitement is my reacting system (he laughs)! We see a difference between his first consultation and second consultation, although the centre of both is “excitement”. In our first consultation, I did not go deeper into his experience, but in our second consultation, we come to another non-sense experience where everything makes sense to him. Now, with the background of the first consultation, it is easier for me to understand the language of his non-sense. He is talking about a physiological process which is happening in the body, and I understand from previous cases that this is the language of sarcodes. He correlates that process with the adrenaline reaction process, so it is easy to see his indicated medicine. There is no headache and he feels extremely good. He feels calmer than before, so no repetition is given. Follow up after 4 months: no headache, but he is starting to react with everybody and his wife says he argues a lot. Repeat Adrenaline 1M. I observe in my all steroid cases they are very reactive or impulsive. There is not much mental thinking behind their actions: they do things suddenly and impulsively. Another facet of their hyper-reactiveness is impatience and speed, whatever they want to do, they do very fast, they want to get it finished in a short time. Stability is another important thing in their life. Basically they are unstable so they are easily influenced by things, as if somebody else is handling their life rather than them being in control. In some cases they try to control everything with their fast and furious actions. Physically they are very restless and move fast. They may fidget their hands, legs, or make involuntary movements.